Reuters reported scuffles at Tehran university today ahead of the speech by President Ahmadi-nejad. This picture grabbed my attention. 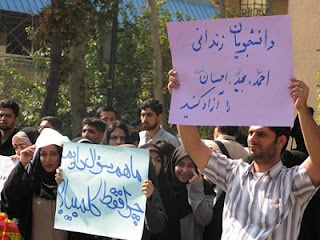 The poster held by the male student asks for the release of three Tehran University students from prison and the one held by the female student asks "We have questions too, why just Columbia?" The question is one asked by Iranians all the time. For the SS-lamic regime has one window dressing in order to impress the outside world but the reality of what happens inside Iran is always different from what is nicely packaged for outside of Iran. Ahmadi-nejad is prepared to answer questions from Columbia students but not from Iranian students. The consequences of asking questions in Iran can lead to imprisonment. I fully agree ... westerners, specially the media, do not truly know how to deal with Ahmadinejad and his likes... most reporters do not even know how to ask right questions from him. He can be challenged on all accounts. For example when he says there is freedom of speech in Iran, The Western reporter fails to ask: "Why then so many newspapers are shut down.?" or When Ahmadinejad says: " Iranian women are the freest of women in the world." The western reporter fails to ask: Then why women are brutally beaten for wearing light make up and not adhering to the Islamic dress code? There are plenty of examples (unemployment, inflation, poverty rate, addiction) with which Ahmadinejad can be challenged. But the Western reporter (media) is not savvy enough or knowledgeable enough about Islamic Republic's atrocities to ask the right questions.